deSIGNery Signs now offers 12 of our most popular round Brushed Chrome Stickers at discounted prices & Faster Shipping. deSIGNery offers the high class and professional round custom printed brushed chrome and chrome stickers that your company is looking for. Brushed chrome and custom chrome stickers are popular because they aren’t just plain white stickers. Common industries and companies using our brushed chrome stickers include pharmaceutical companies, airline companies, education facilities, attorneys, healthcare industry and real estate companies to remind customers for future sales or where to get the maintenance service that you offer. Check out our Spring Sale for savings on Custom Round Decals and Brushed Chrome Round Stickers in the following link. BBB Member since 2004 with a proven record of complaint free customer satisfaction on items like Custom Round Decals and Brushed Chrome Round Stickers. Click on the BBB logo above to check our record or leave a customer review. At deSIGNerySigns.com we have more than 24 years experience in designs for our Brushed Chrome Round Stickers. Call us today and let our design specialists help create your next project to promote your product or business. FREE Shipping on all decal and sticker products | Free layout | A+ BBB rating | 24 years in the business | Call Today for a free quote on Brushed Chrome Round Stickers. 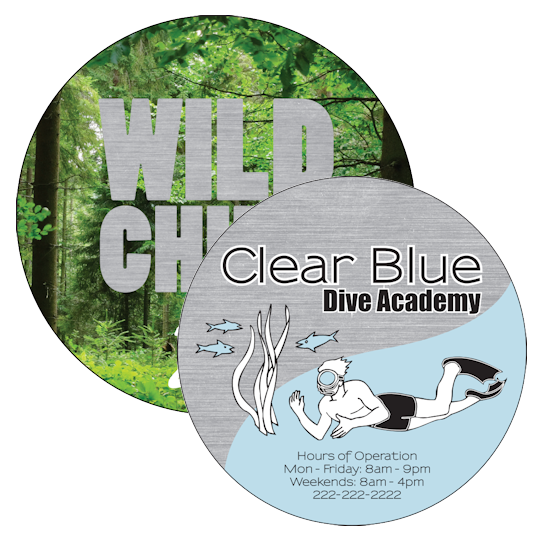 deSIGNery Sign Co. offers indoor or outdoor custom brushed chrome round stickers on durable chrome polyester material for your custom brushed chrome round sticker projects. Not sure what will work best for your project, our design staff will advise you on the recommended type of material for your application needs. Please specify application needs when ordering or inquiring information about brushed chrome stickers. Because our quick ship chrome polyester round stickers are printed on premium polyester, they can be used for outside applications and will hold up well under most weather conditions. These are a great value when you need a custom printed round decal that has vibrant colors, and is used in an area where there is not a lot of solvents or abrasion. Great for identification or company name or round shaped company logo. Our round brushed chrome decals look awesome when used on your equipment or products to convey operating instructions, safety precautions, company name or motto.